I purchased a Canon 5DIII (body only) from eBay. It was not a grey market. but interestingly enough, it came in a with 24-105mm lens box. I assume the seller bought the bundle and spilt up the items for resale to make his profit. But had I known all of this, I wouldn't have risked it and just bought from BH. Good info. Thanks!! This doesn't really reflect my personal experience. I've been buying "import" Canon Cameras for years. I've never had trouble getting warranty work or work from Canon Professional Services done on them. At one event that Canon CPS was at I asked a tech how they tell a gray market camera from a USA model and he told me flat out that they couldnt tell the difference. I know that my last 1DX came in the identical packaging as the USA model and it's made in the same factory. I used to always by from an "authorized dealer" but then realized that the price difference could cover a major repair if necessary, especially on a 1DX which I bought for over $2000 below the retail price! Sorry, but this article feels more like a FUD. Maybe I was just lucky, but I got most of my gear on grey market straight from HK (to the UK). Every time it was fast, reliable, as advertised. I saved (15-20%) on each piece. I have insured all my stuff with established and reliable photo/astro insurance company in the UK. No proofs of purchase were required or any other documentation. Just S/N and my price I put on it. I pay about £180 per year for 1 body and 4 lenses. If I summarise all discounts I got on grey market, I might not have original Nikon warranty (which only covers manufacturing faults for 2 years), but I have 6 years of insurance on anything (theft, my clumsiness, manufacturing faults, loss, extreme weather…) instead. But maybe US situation is different from UK? I buy from reputable retailers, B&H, Adorama, and for used gear, KEH. December 2013, my wife showed me a package deal for a Canon 5D Mk III with 24-105 F4 and asked me if this was a good deal. I checked B&H and found a similar package for $3500. I don't know who the retailer was at Amazon, but I didn't need the cheap tripod. My wife likes to look at rakuten.com (formerly buy.com); but she hasn't bought anything from their retailers. 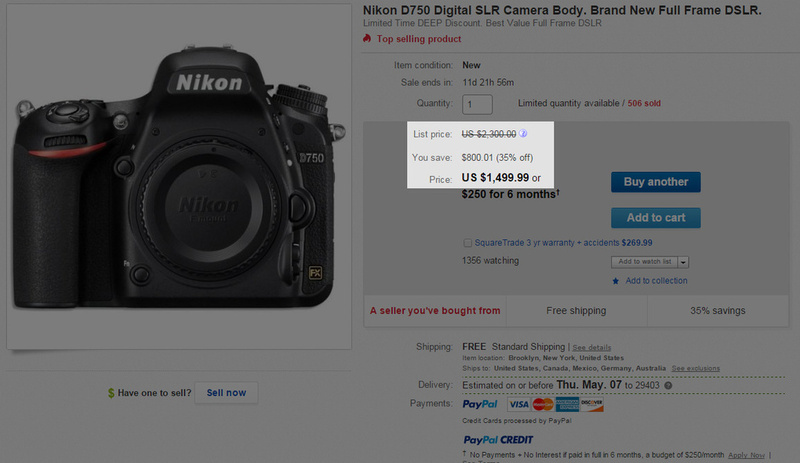 I saw a 5D III with a markdown of 95% for over $3000, so what they did was jacked up the MSRP to make it look like a great deal. I'd be cautious with that site. KEH has a storefront on EBay, so I have no problem with them. I bought a used Canon F-1N from KEH and had it replaced with their 6 month guarantee. I don't buy gray market goods; cameras, cars, medicines, sports tickets...whatever. For more than a generation, I've been employed as a failure analysis engineer and an aerospace quality engineer. Whenever I hear "It's just like..." my skin crawls. I've seen some very bad things. Granted, when a camera fails it's not going to blow up or fall out of the sky, so the consequences of failure are lower than for aircraft. Regardless, engineering rule number one is Murphy's Law. Engineering rule number two: Murphy was an optimist. Why add the risk of non-recovery? Additionally, how many emails, phone calls, wasted time and frustrated hours are you going to spend to save a few bucks? If you're even a part-time pro, you're probably charging a bare minimum of $200/hr for your time. If you aren't averse to those risks, then by all means buy from the gray market. Personally, I would rather sleep well knowing I've supported a credible supply chain with established, verified, legal agreements between parties who are willing to stand behind their products, regardless whether they are the distributor or the manufacturer. Theres no doubt its a fair point. I'm in Ireland where the retail prices of photography equipment tends to be far more then in the states. Honestly if I could even get my gear at B&H prices I'd be happy with that. Typically the grey market prices can be anything up to 50% cheaper then the bricks and mortar shops here. I wish I could afford to support local businesses but when its a case of the online alternative costing near half the price its just too much a difference to justify. Also at that kind of price difference the peace of mind argument goes out the window too, as I could often order 2 of the items for near the price I'd have paid here. I'd have more peace of mind in knowing I had 2 of a certain piece of gear, then 1 with a warranty. In your case, the economic benefits far outweigh the low risk of failure. 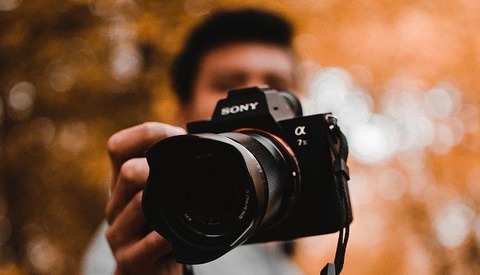 Nikon and others are creating the gray market by selling thousands of cameras to non authorized dealers. B&H and others are making an additional 500 dollars profit on the cameras where as ebay and brick and mortar sellers make less per unit. So why does Nikon and others not honor the warranty for the same camera that of gray market that comes off the same assembly line as non-gray market? It looks like that Nikon and others who sell their units for the same price to the all the dealers making their profit does not have to honor the warranty on everything they produce. Fair or Capitalism? Does this mean I need to buy 3 cameras when I shoot 33.3% in Australia, 33.3% in Europe and 33.3% and in the US??? That will get expensive. I never had no trouble to get my Australian Mac repaired at the Genius Bar in Germany ... no issues! Why can't camera companies do the same ... Same camera ... different regions ... different price points for the local market. Just money making to adjust to local prices. Worldwide operations means worldwide warranty for me. Esp. here in Australia cameras are overpriced ... I would have spent around $1200 more for my 5DIII a few years back ... I could catch a flight to Hong Kong to personally get it to the service centre. 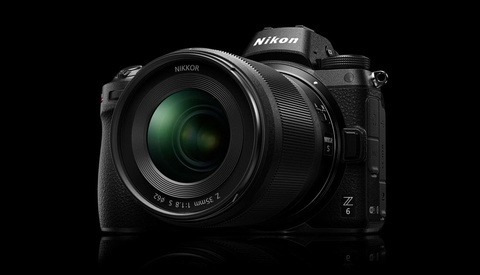 Buy two of them (total cost = 3000$ or 700$ more than a single, legit camera). You just got your "insurance" (second body), at 100$ off the rip-off of new and legit gear. WOW! Somebody posts an article that has a brain!!! Great job!! Except for the contextual errors, would help if there is an editor. I agree with Casey and his article pointing out why one should not / ever consider these types of Gray market purchases and have wondered if by having them promoted on FStoppers if indeed the community is being well served. A Nikon user and with 5 bodies in my lineup I would love to save $$ every time I pull the trigger on a new body but knowing how these devices go I depend on being able to have my bodies serviced by Nikon Canada without issues. Kudos to Casey for stepping up and out with the article. 2 out of my 3 cameras were purchased on the grey market. (eBay) I was able to get both insured, both were brand new sealed in-box, both also came with USA warranty cards, & both were $500+ cheaper than retailers. If it makes people feel better to buy from an authorized dealer, then I would recommend doing that. Worth noting that eBay sellers don't have the overhead expense B&H and other retailers have, which is another reason they can be cheaper. 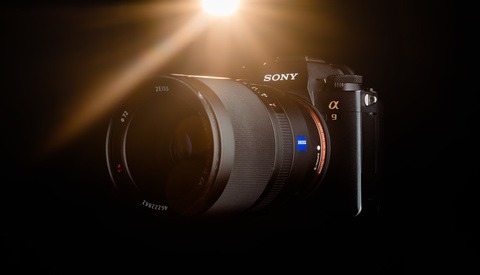 I have a D750 grey and a D750 uk spec the grey was £400 cheaper and they both look feel and work the same. Damn. I didn't know Nikon had a 20% failure rate. Nikon must be total crap! Surely the writer doesn't actually believe there is a 20% chance of product failure. If you are going to write an article like this at least make an attempt to get accurate statistics. Obviously you don't have "a 20% chance of paying another $1500 later." My oldest gray market camera body is a 1993 EOS 630 that I still have and still works. There have been a few dozen others that I have bought and sold over the last 30 years and I guess I have been extremely lucky since I have never had a product failure that occurred during what would have been the warranty period. Even if I had, I've probably saved $20,000 over that time period by buying gray market, so I could have afforded a few failures and still come out ahead. 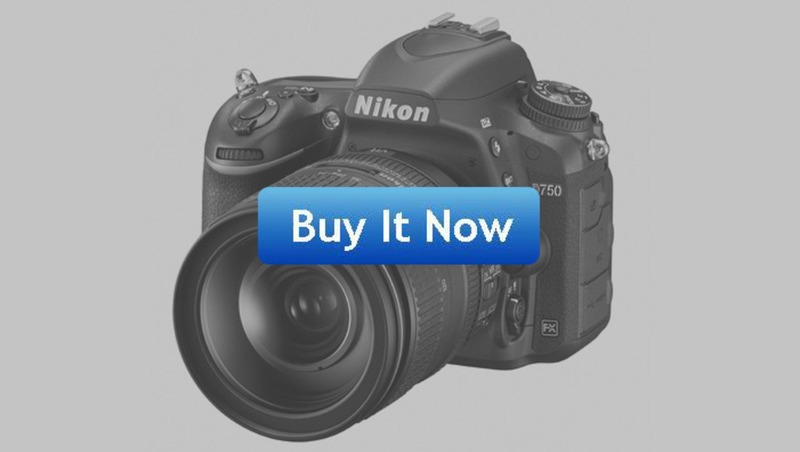 I purchased a Nikon D800 in May of 2013 via Ebay from a Photography store in Canada. Everything was all fine and good until I noticed that the Ten-pin remote terminal was easily pushed back into the camera body when trying to use it for the first time approximately 6 months later. I contacted Nikon USA and they wouldn't touch it. I contacted the Camera store from Canada and they gave me shipping instructions which included not being able to insure the package, which would cause customs to add a VAT coming into the country that I would be responsible for. Reluctantly I shipped my camera to Canada for warranty work through Nikon Canada. I have never felt so nervous shipping my camera in that manner before. 3 weeks later I received my camera back from the camera shop. It was in perfect working order and didn't have any more problems with it. My experience with the Camera shop in Canada was excellent. That being said, when I purchased my Nikon D810, I made sure that it was a USA Nikon and not a Grey market camera. It removes a lot of the hassle of shipping and warranty work that you may have to utilize. I have owned a grey market Nikon and Nikon would not allow me to download manuals for the camera. When I entered the camera serial number I was told that it was not a valid USA serial number. I can suggest going on this page https://twitter.com/20four7va and ask their professional opinions.